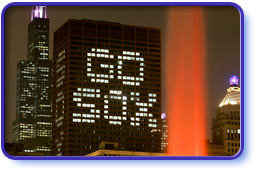 Offices inside Chicago's CNA building are lit up in support for the White Sox. The building is flanked by the Sears Tower, left, and Buckingham Fountain, right. Da Mare. Recognized as the "last of the big city bosses," Daley served as Chicago mayor for 21 years. This Irish Catholic Bridgeport native led the city through the 20th Century's most politically tumultuous era (1955-1976). born Rumsfeld. Served as U.S. Secretary of Defense under both the Gerald Ford and George W. Bush administrations. He is the youngest, oldest, and possibly most controversial person to hold the office. Chicago's first African-American mayor, Washington also served in the Illinois Senate and U.S. Congress. Many city facilities and institutions bear his name, including the main branch of the public library. The first permanent non-naive American settler in the region built camp somewhere near what is now the Michigan Avenue Bridge. This African American has a high school, harbor, museum, and park named in his honor. The first American woman awarded a Nobel Peace Prize, Addams founded Chicago's Hull House and championed the social concerns of immigrants, children and women. Named after an early Illinois statesman, Daniel Pope Cook, the county was created in 1831. Cook County government offices are found at the County Building on North Clark Street, and at the Richard J. Daley Center and Brunswick Buildings on West Washington Streets. More than 800 local governmental units oversee Cook County's 5.3 million people..